1 of 4 Press a 24-inch long piece of nonstick aluminum foil into an oval slow cooker bowl, with nonstick side facing up, so that it is flush with bowl and ends hang out over sides. 2 of 4 In a large bowl, gently stir together turkey, onion, green pepper, egg, garlic, 1/2 cup tomato sauce, bread crumbs, 1/3 cup cheese, 1 teaspoon Italian seasoning, garlic salt and black pepper. Place meatloaf mixture in slow cooker and form into a 9 x 5-inch log. Cover and cook on HIGH 2-1/2 hours or on LOW 4-1/2 hours or until internal temperature registers 160 degrees on an instant read thermomter. 3 of 4 About 30 minutes before cooking is complete, place remaining 1/4 cup tomato sauce in a small bowl and stir in remaining 2 tablespoons Parmean cheese and 1 teaspoon Italian seasoning. Pour tomato sauce mixture over meatloaf; cover and continue to cook another 30 minutes. 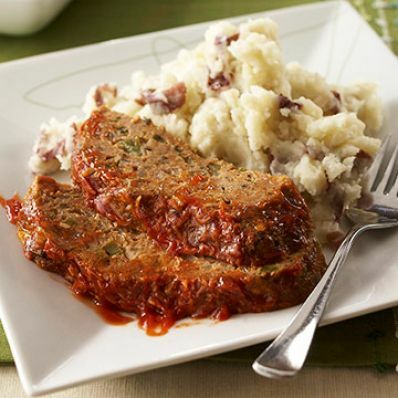 4 of 4 Carefully lift meatloaf out of slow cooker using foil cradle and place on a cutting board. Using two long offset spatulas, carefully lift meatloaf off of foil and place on serving dish. Discard foil and any liquid and serve immediately. Per Serving: 454 mg sodium, 1 g fiber, 171 kcal cal., 9 g carb., 19 g pro., 7 g Fat, total, 2 g sat. fat, 73 mg chol.